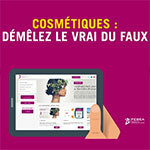 Parabens, phenoxyethanol, nanoparticles of titanium dioxide, PPD, phthalates, perfume allergens… FEBEA (French Federation of Beauty Companies) has decided to defend controversial cosmetic ingredients with a campaign entitled ‘Distinguishing truth from falsehood’. Six videos of less than a minute are accessible to the general public on YouTube to pass on a few messages essential to the industry. ‘As – sometimes contradictory or inexact – information keeps being broadcast “at click speed” on the web and its social media, it is only natural to provide a few clarifications on the ingredients used in hygiene and beauty products’, explains FEBEA as an introduction to this new campaign posted online on September 18, 2017. It is to counter recurring negative information on the safety of certain cosmetic ingredients that FEBEA decided to take action, by presenting their defence arguments in short videos. And in passing, it is quite clear they have a dig at natural and organic ingredients. All this makes their communication strategy quite old-fashioned, although at least they do have a strategy and they do try and speak up differently, considering today’s debates. Still… consumers are getting ever-more wary. Will that do to convince them? • Have a look at the FEBEA Campaign introduction page – ‘Démêlez le vrai du faux’ (Distinguish truth from falsehood) , on FEBEA’s website.